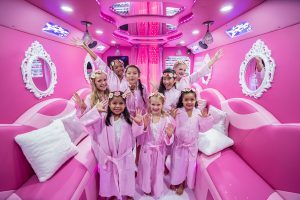 Little did you know before, but there is an incredible Kids Party Spa Bus Houston TX. Rock Star Party Bus is just around the corner! This is a unique experience so close to home that, in the way of mobile spa services, is the best kids spa party. We want an opportunity to show you how great this experience can be. While seeking out ideas for your little girl’s birthday party, we want to be considered! Our services are suitable for girls between the ages of 4 and 12. Boys are also welcome, though this luxury service is definitely geared towards young girls. We have many party packages suitable for all kinds of parties and quality fun time. If you are hosting a birthday party, sleepover, or just want to give your kids a special day, we can provide it. We also host a Mommy and Daughter Package that will allow you and your daughter to spend time together while making her feel important. 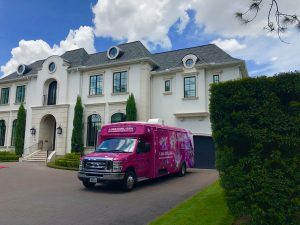 In this article, we’re going to tell you about Rock Star Party Bus and how we can entertain your little prince or princess. If you are a mother with a young daughter, we have a service that would be ideal for quality entertainment. Our Mommy and Daughter Package is tailored to you and your daughter, and any other daughters or friends who want to come along. You want your girl to have fun, but maybe you want to be there so that she can feel important. We understand that, and that’s why we’ve created this package for you. You also want to be able to relax, and there’s no better way to relax with your daughter than to get pampered together. Imagine surprising her with this! A pink spa bus parks in your driveway and she runs out to see it. You tell her that it’s for her, and you both go in and get your nails done together! No doubt this will let her know how important she is to you, without ever having to leave your home. We know she’ll love it, and we think you’ll love it too! Our Neon Glow Party Package is great for bigger parties with boys and girls. They will get to dress like rock stars and move with the groove of their favorite music. This is a great way to help your kids feel like they’re celebrities. The confidence boost could be life-changing! Allow them to let loose and remind themselves that life is about having fun. This is our best package for a mixed audience of varied ages and both genders. It is less focused on the spa aspect of our bus and more on the party aspect. If you need to host a birthday party, this or one of our similar packages may be ideal! The recommended girls age for this experience is 4 to 8. This experience is meant to focus on making your little girl feel like royalty. It includes jewelry, crowns, wands, wings, and feathers so that she feels like a magical creature while with her friends. Even princesses need to take a break with a relaxing spa day. Our spa bus professionals will help them paint their nails and apply royal glamour makeup. This package is ideal for a sleepover or birthday party focusing on your little girl. If she has been dreaming about being royalty, this will reinforce that idea in her. We, and you, want to give her that sense of importance she needs to grow. Since this is a local service and our spa is mobile, we can park right in your front yard. This means that you can engage your kids in a great experience all from the comfort of your home. You can sit on your couch inside with a book and some hot tea while your little princes and princesses go crazy in the front yard. This is ideal for any parent who wants their kids to have fun without going too far from home or accumulating travel expenses. For an extra fee, we will go outside of our 30-mile radius, centered in Cinco Ranch. That way, we can give your kids the best experience possible. This also keeps it so that we can serve our community loyally. No more than 14 children are allowed in the Rock Star Party Bus at a time. The majority of our party packages only cover 10 children and every additional child is $30. Parents are encouraged to be nearby, but only one will be allowed in at a time due to limited space. We ask that you pay a $200 deposit which will go towards your final bill so that we know our appointment will be kept. If we need to reschedule due to issues on either end, we can, but we prefer you give us a 24-hour notice before cancellation or you risk forfeiting your deposit. Friends and family members can buy gift certificates towards the price of our party packages online. Call 844-GIRL-SPA (4475-772) today to talk to us about our great services. We would love to help you get set up with one of our fun experiences. One of our helpful representatives will be eager to help you. Alternatively, you can fill out our contact form here. We will get in contact with you as soon as possible, because we want this experience to be the best! 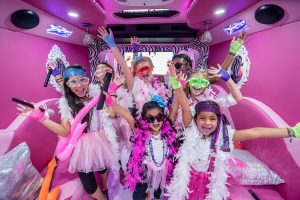 Rock Star Party Bus has the best Kids Party Spa Bus Houston TX! Houston is where NASA is based out of. It was named after Sam Houston. Home to the largest medical center in the world!